The system is equipped with safety devices that set in before critical conditions are reached that may pose a risk to the operator. • Safety devices that form an integral part of the system and are provided by the manufacturer. • Devices, precautions or protections the customer has to provide for. The safety devices installed serve to protect both the operator and the system (they prevent the machine from reaching critical conditions). Protection against unexpected failures is assured by the careful design and the components selected (both provide wide safety margins) taking into account the operating speed reached by the machine and the operations it performs. A series of labels on the machine warn (as well as indicating any residual risks) the operator not to make any risky manoeuvres that might put his own, others’ and the machine’s safety at risk. • General safety regulations set out in the international directives and the legislation of the country where the machine is used. Wear personal protection devices in areas where required. Pay the utmost attention to the precautions, warning or danger signs on the machine and on the system. Wear working gloves when operating on the machine. Wear a headset to protect hearing. Wear a hard hat when operating the machine and during maintenance and adjustment operations. Do not wear clothes, jewellery or accessories that might get caught up in the moving parts. • Designed and built with both active and passive safety features for peace of mind. • Ergonomic design to minimize fatigue. 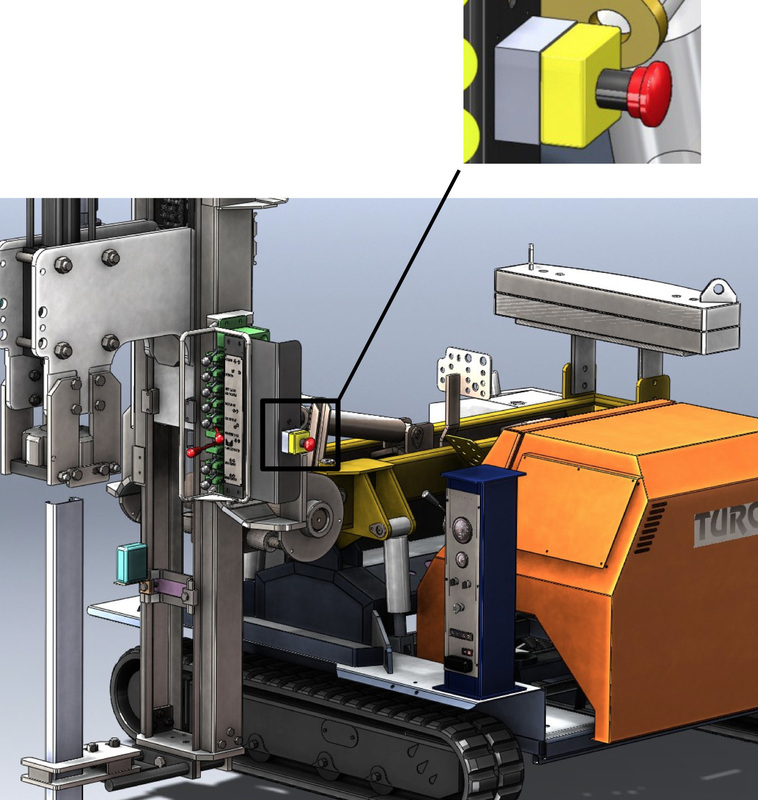 • Control panel positioning allows operator full and clear view of the entire operating process. • Highly visible and easily accessible emergency button to shut down entire machine operations in the event of any type of emergency. • High quality hydraulic hoses and fittings to eliminate any unexpected contact with hydraulic fluids. • Anti drop valves on the hydraulic system prevent any uncontrolled movement if the hydraulic pressure ever fails. The metal (or Plexiglas) guards completely cover all the moving parts within wide safety margins. The guards are fitted with opening devices or retaining screws that can be removed whenever necessary to perform adjustment, cleaning and maintenance operations on the parts. If operating with the guards removed, the operators in the vicinity of the system might come into contact with moving or particularly hot parts. It is in any case prohibited to remove the movable or fixed guards when the machine is running. The manufacturer is relieved of all responsibility for accidents caused by operating the machine when the guards have been removed! The mushroom button is highlighted with a specific colour in accordance with the regulations in force for emergency stop buttons. When the mushroom button is pressed it stays locked in that position. To restart machine operation, turn it clockwise to the original position. Functionality of each emergency mushroom button must be checked every 300 hours of operation. These devices allow immediately stopping the machine when a condition dangerous to the operators or the machine occurs (malfunctioning, unusual noise, possible failures, etc. ).The mushroom button is positioned on the control panel. The machine is equipped with adhesive warning labels that help the operator work in complete safety. These warning labels indicate the residual risks that could not be eliminated by employing safety devices which would not permit normal system operation. These adhesive labels must always be well visible and may never be detached or damaged since they form an integral part of the system. Should they deteriorate, contact the manufacturer for a copy of the adhesive labels to be replaced. The manufacturer declines all responsibility for damages caused to the system or persons if the system is used without the aid of the adhesive labels with which it was delivered. The machine is equipped with safety microswitches which when tripped immediately stop all the machine movements. 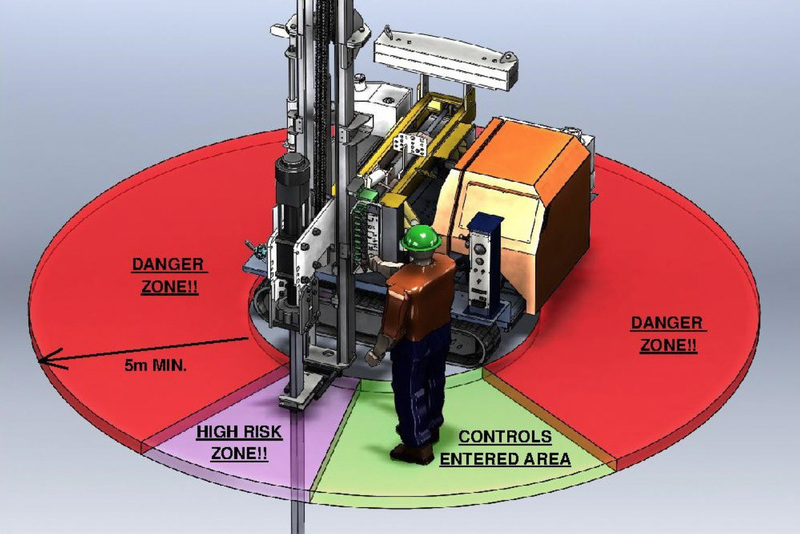 When knocking against the guards, the microswitches are tripped and all the moving parts of the machine are immediately stopped. It is strictly prohibited to disable the electrical and mechanical safety devices or to remove the safety devices provided by the manufacturer in order not to compromise the safe operating conditions guaranteed by the manufacturer. Ensure that all the persons involved in machine use, maintenance and cleaning are aware of the relative safety regulations. Also ensure that all the safety rules are respected. Do not allow unqualified persons to work on or access the control panel or any other electrical equipment. Do not perform any maintenance or cleaning operations without first having extracted the ignition key from the control panel. The owner is responsible for keeping all the danger warning and data labels in perfectly visible and legible conditions. New labels can be ordered from the Spare Parts Department at any time. The operators may not wear any jewellery, accessories, rings, chains, etc. that may get caught up in the machine during ANY maintenance operation. The operators must wear working clothes according to EN regulations. It is strictly prohibited to use the machine if the wind force exceeds the permitted reference value (for the exact data, refer to the relative paragraph in this manual). Do not move the machine with the antenna in vertical position. Before starting the engine, make sure that all the controls are in rest position. Before starting work, check that there are no underground cables or ducts in the working area. Do not use the hydraulic hammer for load pulling or lifting operations. Never use the system equipment for uses other than those for which it was designed. Never use the machine in closed or insufficiently ventilated places, since high concentrations of noxious gases might be created. Ensure operator and any other person in proximity is using suitable Personal Protective Equipment, i.e. Hard Hats, Ear Protection, Etc. Do not position the machine on slopes or unstable ground. Do not position the machine in the proximity of open electric lines. Make sure that you work standing at a safe distance. The operator must ensure that there are no other persons around the system while it is running and must never leave it running without supervision. Make sure that the persons involved in system operation are trained beforehand, have read all the instructions in this manual, are physically and intellectually capable and consciously do their job. Do not allow untrained persons or under the influence of alcohol and drugs to perform any operating procedure. Check and ensure that all the persons involved in use of the system know and respect the SAFETY RULES. Do not start the system if all the safety devices have not been enabled. Do not disable any safety device. Before starting, check that any objects, tools or obstacles that may hinder operations have been removed. The operators may not wear any jewellery, accessories, rings, chains, etc. that may get caught up in the machine during normal operation. Never touch or stand close to the moving parts of the machine. During transport, installation and use of the machine it is strictly prohibited to allow untrained and/or unauthorised persons to stand or walk in proximity of the machine. The machine may not be used in explosive environments. Do not perform any cleaning operation while the system is running. Before starting the cleaning operations, check that the ignition key has been extracted from the control panel. Do not clean the electrical components with water or other liquid products. Always wear the appropriate personal protection devices such as overalls, gloves, hard hat, goggles resistant to highly corrosive cleaning products, etc. Do not allow unqualified persons to perform adjustment, part replacement or maintenance operations and ensure that the persons involved have carefully read the maintenance section in the manual and the relative safety regulations and that they are respected. Do not perform any maintenance operations while the machine is running. All the maintenance operations must be performed with the machine turned off and in such a condition that it cannot be turned on inadvertently.